Me and one of our investigators. 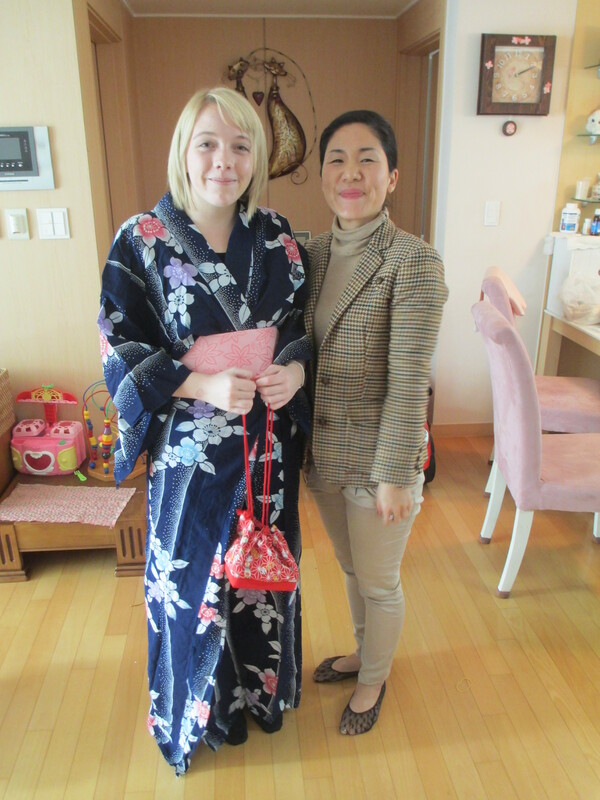 This was the first time I met her and I didn’t understand anything, but all of the sudden I’m dressed up in a Kimono and we’re taking pictures. Okay! Right on! 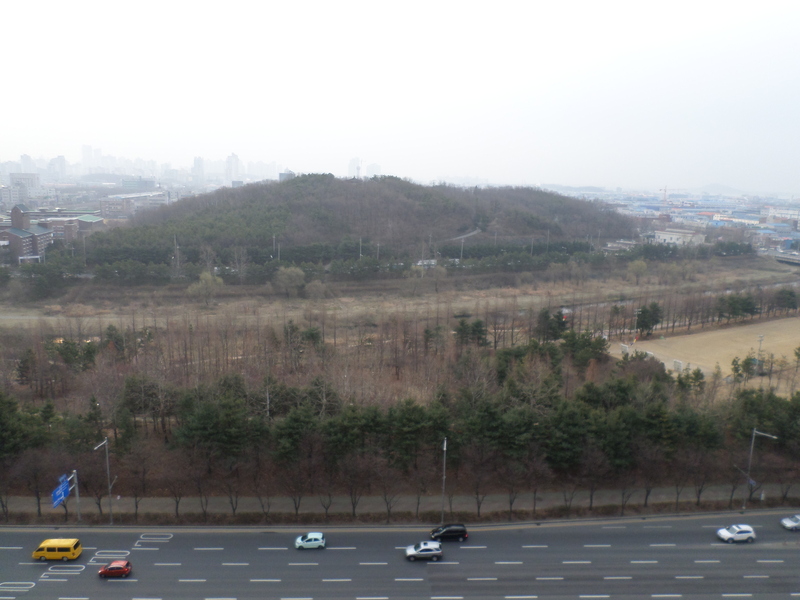 I love Korea! First off, we committed one of our investigators to baptism. She’s amazing! She has so much faith. She’s from a town outside of Hong Kong, China, and she’s learning English and Korean right now. We teach her in English because she understands it better than Korean (I do, too), but she reads the Book of Mormon in Mandarin Chinese. She’s so cool! She loves the Church, but her husband and mother-in-law go to a different church in Korea and don’t want her to attend our church. She actually told us that ever since she’s met with the missionaries, she feels really guilty every Sunday that she’s not at our church. She’s starting to give up coffee, and pray, and do everything that we’ve been teaching her because she believes it’s what God wants her to do. We felt prompted to promise her that if she keeps trying to keep the commandments, the hearts of her husband and mother-in-law would be opened to her attending and eventually becoming a member of our church like she wants. Ahh! She’s so amazing! I’ve been praying for her everyday. Something about Korea that I wasn’t expecting was how many Christian churches there are. There are so many! I realized that every single corner has a cross on it for this or that church. Lots of times we run into other preachers on the streets who are passing out things for their church. Lots of people advertise by putting their info on packages of tissues and wipes. We have so many wipes in our apartment. It’s actually kind of nice because some bathrooms in Korea have the toilet paper on the outside of the stalls (don’t ask me why), and their packages come in handy when I forget to grab some before I go into the stall. Haha! I think lots of the preachers would be mean to us, but they just assume we don’t speak Korean. I haven’t learned the vocab for anything mean so I wouldn’t understand even if someone was mean to me. I guess that’s one of the perks of not knowing Korean very well:) Woo! This morning was amazing because we invited one of the members in our ward and his mom (who isn’t a member) to come hiking with us. It was so fun! 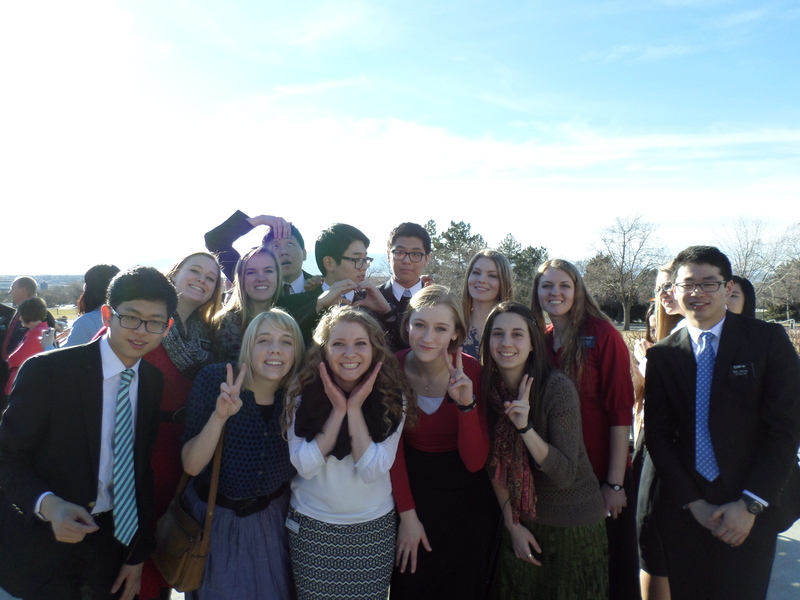 Something I realized with missionary work is you can make it as boring or as fun as you want. My companion and I definitely like to have fun! We like to change things up. I’ve done missionary work in a bunch of ways already. I’ve been on the streets just talking to people, I’ve passed out flyers for our free English class at the church, I’ve knocked on doors (it’s fun in Korea, because people will just yell, “Who are you?” from inside their doors, and you start having a conversation while they’re inside their house and you’re outside). There’s a bunch of things I’ve done. There’s never enough time to email all about it, but I’ve been a diligent journal writer for once in my life so I can share all my experiences with others when I get back. I love the old people in Korea. They are so great. All the teenagers seem to be at school, or after-school schools, or studying at home. They don’t seem to be out as much as they do in America…but the Grandmas and Grandpas are living it up. They’re always at parks with their friends just hanging out and being great! I love them. I can’t understand them, and I don’t think they can hear me enough to realize they don’t understand me, but they are so funny and nice most of the time. All is going well here. I’ve actually been fed lasagna and pizza already by some members and it’s pretty good. I don’t miss any American food. I really like this dessert thing called patbingsu. It has this sweet red bean paste over this icy mixture that’s kind of like a snow cone! Oh! It’s soooo good! I can’t go back to America where they don’t have it now. It’s too yummy! I love Korea! I love the Church! I love sharing what I love with others! I also love reading the scriptures! Ahh they’re just amazing to me! I’m trying to read the Book of Mormon (Korean and English), New Testament, and Old Testament each day. It’s my goal to finish reading the Korean Book of Mormon before the end of my mission (and understand at least a little bit of it). It’s hard for Koreans to understand sometimes, but I really feel like I should do that. 안녕하세요! I’m in Korea!!!!! It’s crazy and I love it! When I stepped off the plane it felt like paradise! It was a crazy first day. I met my mission President (President Morrise) and his wife in the airport. 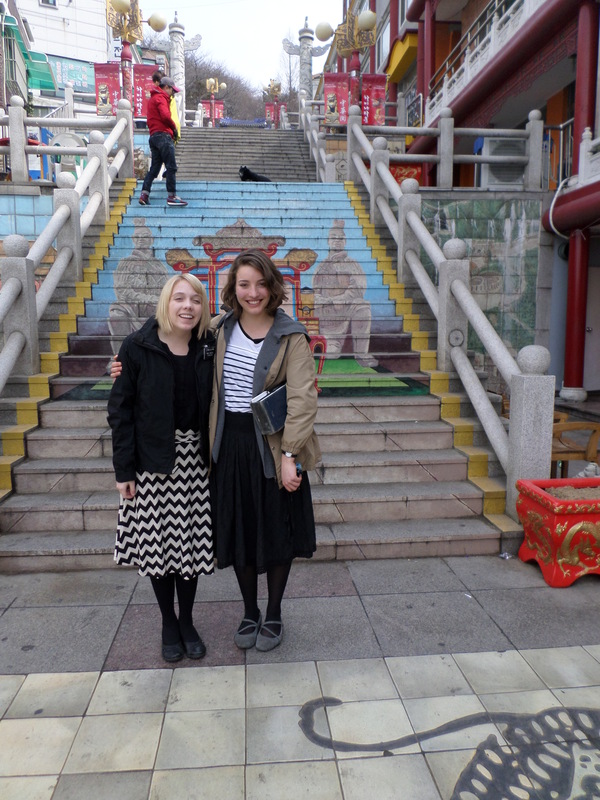 They fed us some Korean snacks, gave us a 몰몬경 (Mormonkyong–a Book of Mormon), and then threw us on the subways and we just started talking to people. I had no idea what was going on and I was so tired from jet-lag, but people are so kind. You can just say Hello to people in Korean and they will then compliment you on how good your Korean is. People also like my hair and eyes and will tell me I’m pretty no matter how I actually look (haha). They love that a foreigner is trying to learn Korean. It makes them so happy. Subways are fun. So many people squeezed together ignoring each other to look at their phone…except us. We talked to everyone. That night we were fed a delicious Korean meal by Sister Morisse (some sort of spicy/sweet meat over rice with Kimchi). It was delicious! The next day I got my companion, Sis. H. She’s from Australia and says “Crickey!” It’s probably the best thing in the world! I love her so much. She doesn’t have that much of an accent when she speaks Korean, but she does when she speaks English. Lots of people will actually come up to us on the street to practice their English and they make me translate what she’s saying because they don’t understand English with an Australian accent. I feel bad, but she’s a good sport about it. She speaks the Korean, and I speak most of the English (haha). View from apt. We ran up that hill one morning and met a guy who used to take English class from the missionaries, but then moved. We invited him to ours and he was super excited. We’re in the Yeosu area. 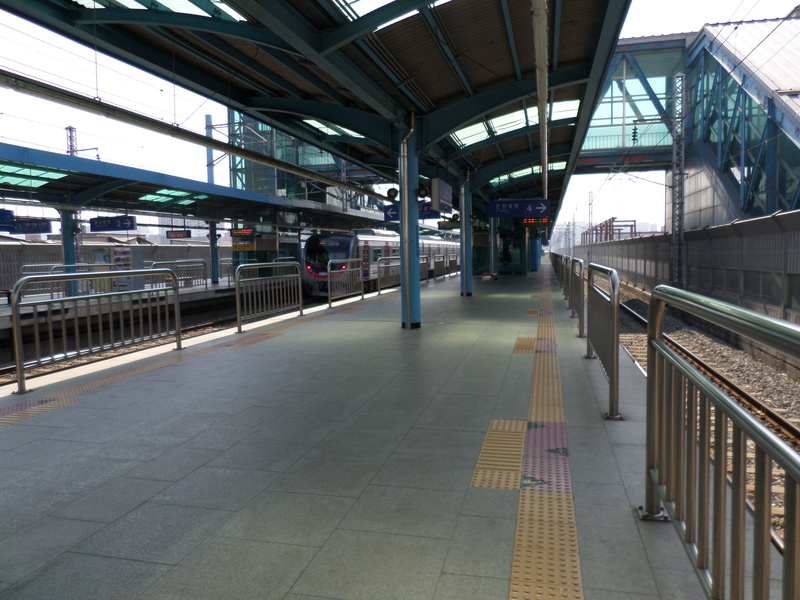 It’s not as crowded as Seoul, but it’s so lovely! We teach a free English class at the church every week and it is my favorite thing so far, I think. That’s where we have found most of our investigators. People really want to learn English here so they are really excited to come. We teach with the Elders in our ward a beginning, intermediate, and free-talking class. I’m teaching the free-talking class because I don’t know enough Korean yet to explain everything, but I love it so much! Everybody is so kind here! I love our ward so much! There’s about 50 people in it. They made me introduce myself and I was so nervous, but somehow I got the words out. At the end, I did say something that would translate to, “I PRAY this in the name of Jesus Christ, amen.” (which is wrong). I realized as soon as I said it, so I jumped back up to the pulpit and yelled the word for “to testify” in Korean. The ward thinks I’m super funny now because of it. I hope they like me. I didn’t understand anything of what was said in church. Apparently during Gospel doctrine, they were talking about First and Second Estates in Korean, so that makes me feel a little better that I didn’t understand. I don’t think I even understand that very well in English. I love the food so much! 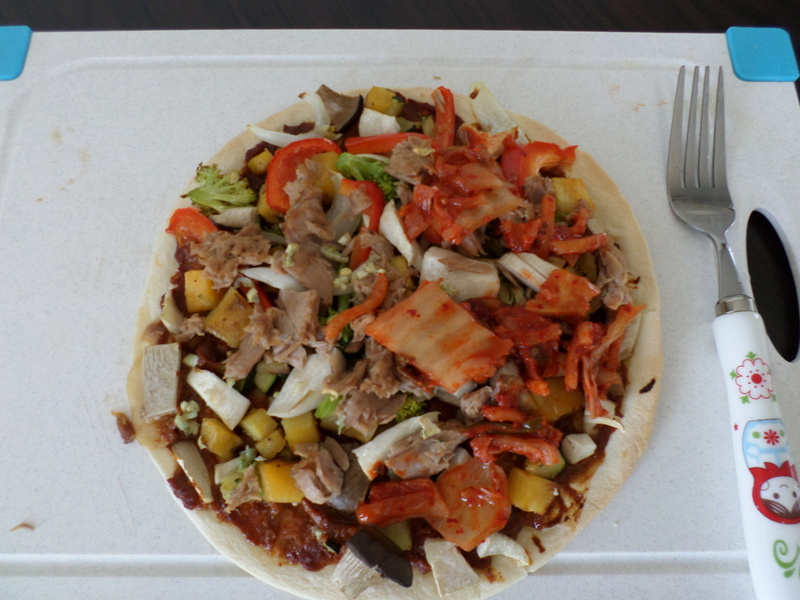 My strategy at the beginning was–if I don’t throw up after eating it, I love it! I actually do love most of it. Except one of our investigators fed us a meal, and I was eating something really crunchy and delicious…and then I realized there were a bunch of little eyes staring back at me. Haha! I think it might have been crunchy anchovies, but I’m not sure. Everyone likes to ask if you’ve tried Korean food yet and if you like Kimchi. If you like Kimchi, they love you a lot! So I love Kimchi SO MUCH (haha)! Korea actually does have the best drinks I’ve ever tried though. I had aloe water for the first time and it’s SO GOOD! I also had this milky soda drink and I don’t know if I can live without it now (haha). We sleep on a little flat pad called a YO. It folds up nicely in the corner and I love it. Korean bus. They are like the night bus in Harry Potter! They’re crazy! But so fun! I feel like I’m on a rollercoaster when I ride them haha! Everything is fantastic! I’m so happy I’m in Korea. I feel so blessed. Love you all! 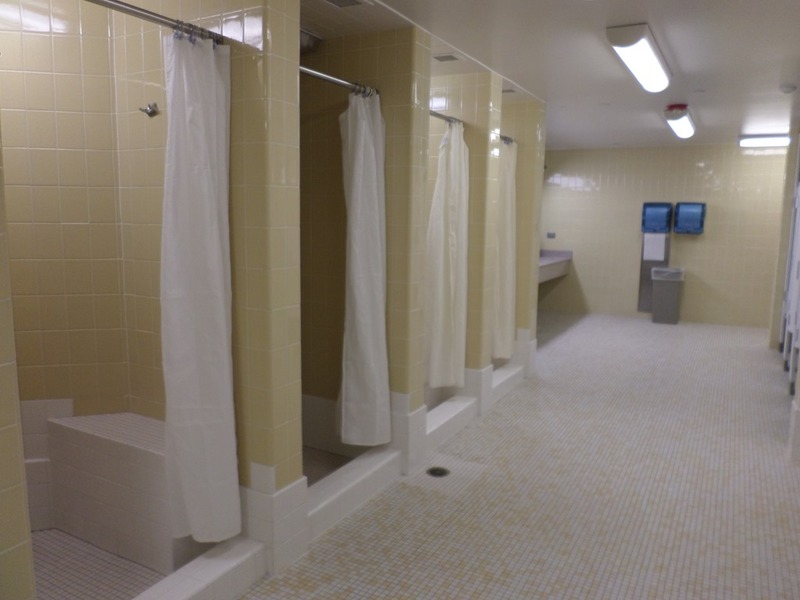 Here’s a picture of the showers. Oooow! Wow! So cool! Actually, it’s pretty boring, but I want to remember it, so here it is. Yeah! 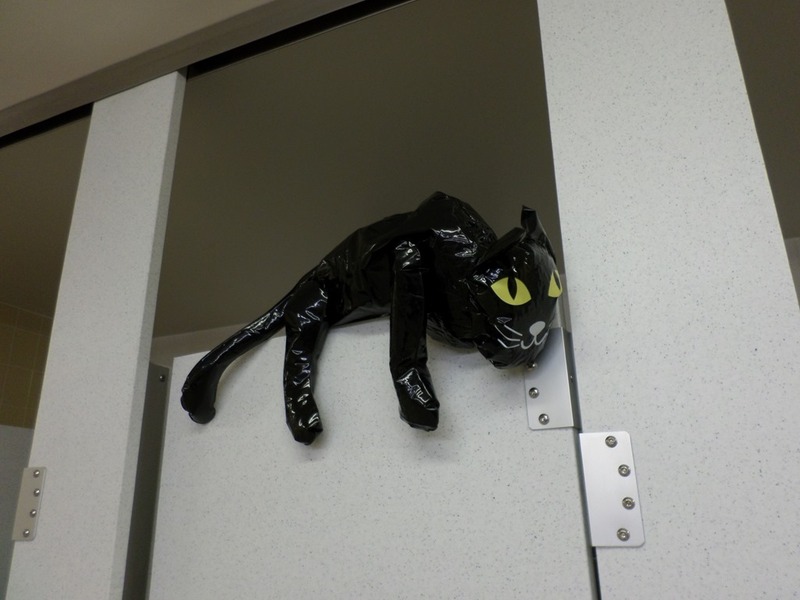 Here’s a picture of Bethesda, the blow-up demon cat that is thrown into showers at night. This is what happens in the MTC after a while. Koreans are really cute and everything they touch turns into cuteness too. 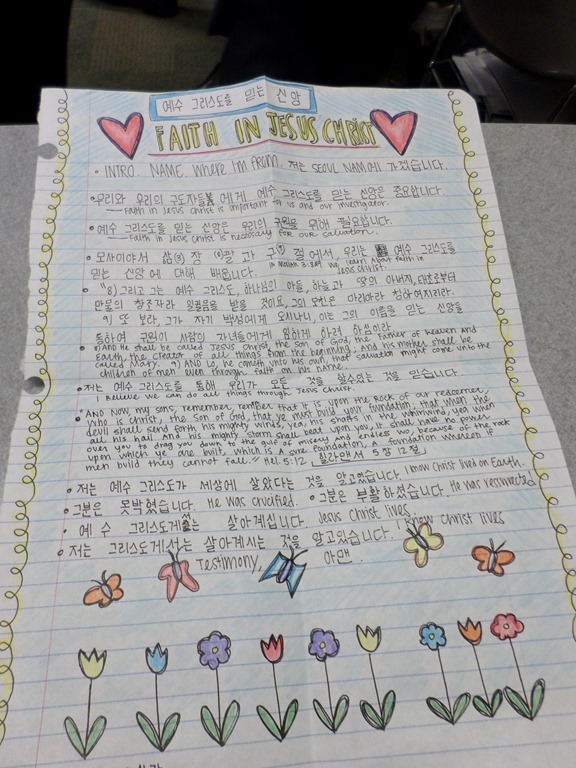 So this is my talk in Korean on Faith in Christ that I tried to make super cute. We have to prepare a talk in Korean every week in case we randomly get selected to speak in Sacrament mtg. I didn’t speak, but I was kind of proud of it so I took a picture. Hello Kimber, look at me, now back to you, now back to me, now back to you. Sadly I am not you but I can become like you if I go on a mission. Look down, now back up. Where are you? You’re in that investigators new house with that new freshly scented bible. Look at your hand now back up you have it, its an oyster with an invitation to that thing you want to go to, look again those invitations are now strength to the youth pamphlets. Anything is possible when you follow steadfastly in Gods footstep. I’m on a dog, woof. Don. R. Clarke of the seventy came to speak at our Tuesday devotional this week. He was amazing. He reminded me a little of President Hinckley in the way he looked and talked to us. Something he talked about to us was miracles. He shared the story of the lady who healed her son’s hip when it got blown off in a massacre by replacing it with some sort of branch (I’m terrible bad with details, I’m sorry, but I hope you know the story that I’m talking about). Anyway, he told us that we have the power to perform mighty miracles, too. We just need to believe in mighty miracles. I think being able to say all that God wants me to say in Korean will be a miracle; but I believe in miracles. I believe in the gift of tongues. 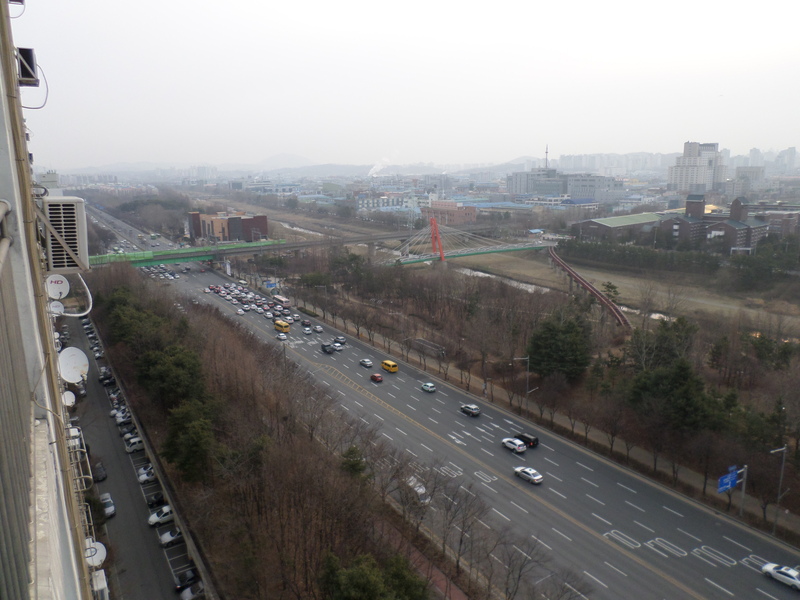 I believe that I have nothing to fear in going to South Korea, because God will not fail or forsake me. I love you all so much! 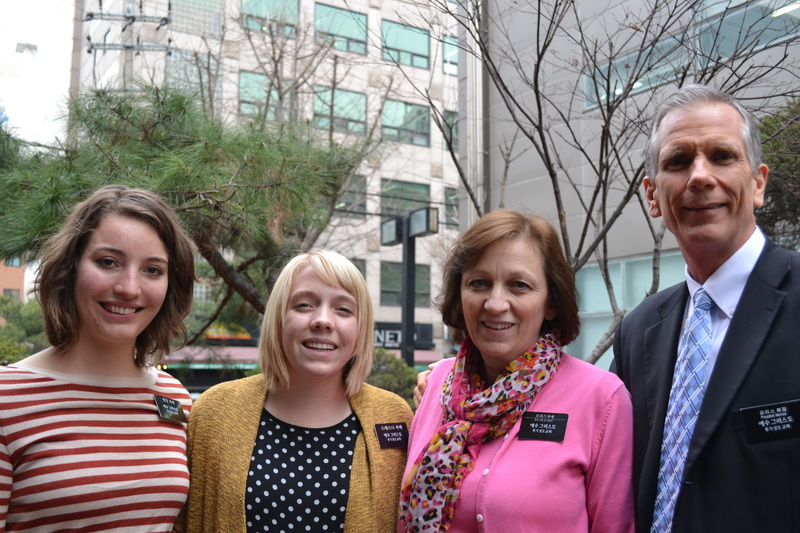 I’m so excited to serve the Lord in 한국 (hangook) Korea! Well this week has been rad! We got to teach some Koreans over Skype. It was a different experience, but so fun. I understand some of what our volunteer was saying, so that’s a plus. We took an LSA this week (a Language Speaking Assessment) where we are given prompts that we are supposed to talk about in Korean. I’m pretty sure I got the lowest score in the class, but my teachers wrote and told me I have a lot of confidence and enthusiasm when I speak, and that will help me a lot as I continue to strive to learn the language. That was nice of them. I feel pretty animated during our lessons because I want our investigator (i.e. our Korean teacher here) to understand what I want to say, even if I can’t say it. Ahh! I get way too into it! I use my hands a lot, but our lessons are never boring. What!? I feel so blasphemous. I really need to work on my pronunciation. The thing about this was that no one even told me until later that night. 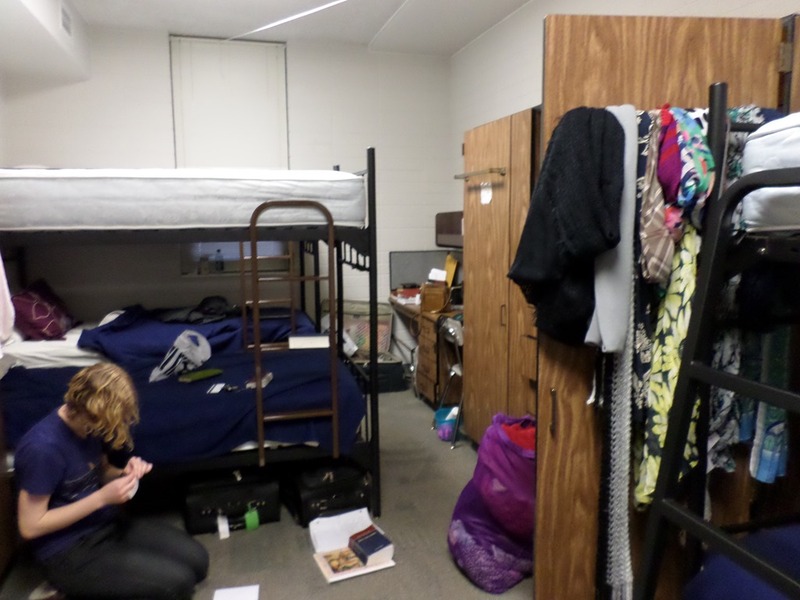 The issue of more Sisters serving missions is not about feminism; it’s about Christ. About 2000 years ago Jesus Christ lived on the Earth. He was crucified. He was resurrected. 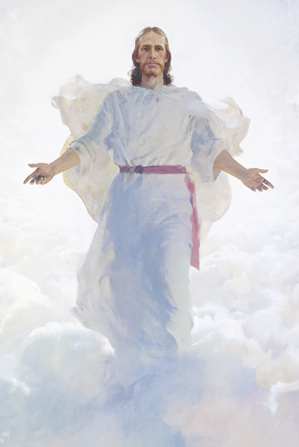 He lives and directs our Church through Prophets and Apostles just as he did in older times. His Gospel is our Gospel, and it is the same Gospel that was given to Adam and Eve at the genesis of mankind. I believe this and nothing can shake me from my faith. I may not know a lot of things, but I know that what I am doing is a much nobler work than the world thinks it is. I get to talk about the LIVING Christ every day! I can’t think of anything better. I am lacking nothing. If anyone does want to know more about women in the Church I would suggest that they read Power in the Priesthood by Elder Neil A. Anderson of the quorum of the twelve apostles, read what members of the church feel about the issue on Mormon.org, or study what we believe in the Book of Mormon and pray to God for more direction. I promise that will never fail. I really do love this Gospel. It means the world to me.